There are two important texts on divorce in the New Testament. In the one text it appears that Jesus explains that the only ground for divorce is sexual immorality (Matt. 19:1-9). In the other text the apostle Paul states that abandonment is also legitimate grounds for divorce (1 Cor. 7:12-16). A significant question arises at this point regarding the disparity between these two answers. Why does Paul seem to add to Jesus’ limitations regarding divorce? Many scholars have wrestled with the tension between these two principles for New Testament divorces. As we seek to understand the relationship between these texts it will be important to further clarify Jesus’ conversation regarding divorce in Matthew 19. When Jesus’ teaching in Matthew 19 is rightly understood we see continuity between his teaching, Paul’s teaching, and the Old Testament covenant vows. At the time of Jesus’ teaching the Jewish leaders sought to set a trap for Jesus by asking him the question we see recorded in Matthew 19:3. Their goal, as the text says, was to “test Him.” Their question is stated directly to parallel the common debate: Is it lawful to divorce one’s wife for any cause. Jesus attempts, at first, to draw their minds to the bigger picture. He doesn’t answer the question but instead points out that divorce should not be a priority concern, since God established, from the beginning, that man and woman in marriage would become one-flesh. He states that no man ought to separate this union. The religious leaders do not bite, however, and return again with the question regarding Moses’ certificate of divorce (v. 7). Finally, then, Jesus answers their question by stating that God allowed for divorce because of sin, and expressly he clarifies in verse 9, that the “any cause” is specifically “sexual immorality.” In other words, Jesus did not believe like the Hillel tribe. Deuteronomy 24:1 was to be understood as a referring to sexual immorality. It’s important to note, then, that Jesus is not here making a comprehensive statement about all divorce. He is not teaching that divorce is only acceptable on the grounds of sexual immorality. If he were it would raise serious questions about why Paul adds to Jesus’ teaching in 1 Corinthians 7. When we consider, however, the historical context we see that Jesus is actually answering a very specific question. He does not here over turn the Old Testament grounds for divorce, but rather clarifies the interpretation of one specific text. This interpretation explains why the disciples were so struck by the teaching (v. 10); it was very contrary to the practice of their day. When we turn, then, to consider Paul’s teaching on divorce we are not at pains to make his teaching align with Jesus’ teaching. Paul’s primary focus in 1 Corinthians 7 deals expressly with the neglect of one of the covenant vows: conjugal rights. Verse one clarifies the issue that the Corinthians had written to Paul about, it revolves around a common saying among certain people of the church: It is good for a man not to have sexual relations with a woman. To this Paul responds, in verse 3, that “the husband should give to his wife her conjugal rights, and likewise the wife to her husband.” In other words, he is defending the traditional marital vows. Then he turns his attention to the issue of divorce, since that would have naturally come up in this context. In verses 10 and 11 he clarifies that believing spouses should not divorce. In verses 12-14, he turns his attention to the believing spouse who is married to an unbelieving spouse. He maintains the importance of the vows, but recognizes here that when an unbelieving spouse refuses to stay in the marriage the believing spouse is not bound to marriage. Since the unbelieving spouse has, at that point, broken his covenant vows the believing spouse is free to divorce. In Paul’s teaching, then, abandonment violates the covenant vow to provide food, clothing, and conjugal rights, and therefore qualifies as Biblical grounds for divorce. Readers will find no tension here, between Paul, Jesus, and the Old Testament. Summary: The New Testament does not reject or disregard the Old Testament teaching on divorce. Jesus’ teaching specifically clarifies the interpretation of Deuteronomy 24:1, but does not provide a comprehensive teaching on all divorce. Paul’s statement on divorce further confirms the Old Testament grounds and fits neatly with Jesus’ teaching. 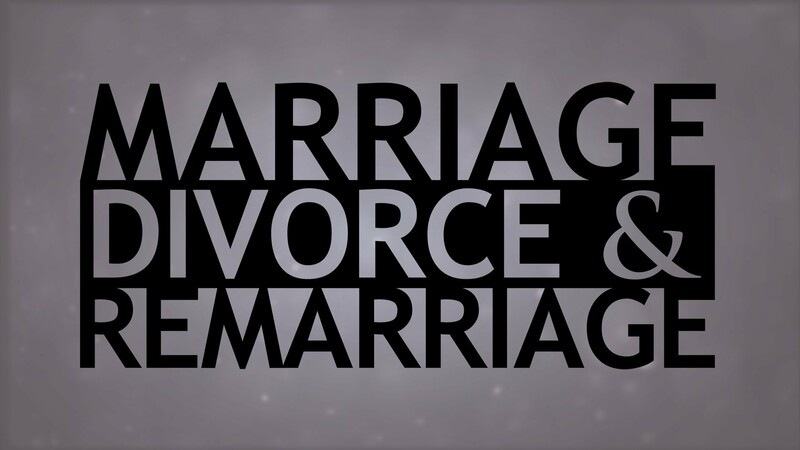 No tension exists, then, between the Old Testament and the New Testament regarding the issue of divorce.